you may pre-order through your favorite bookseller, including Amazon, Barnes&Noble or local independent bookstores. The sexual politics of a faculty wives dinner. The psychological gamesmanship of an inappropriate therapist. The emotional minefield of an extended family wedding . 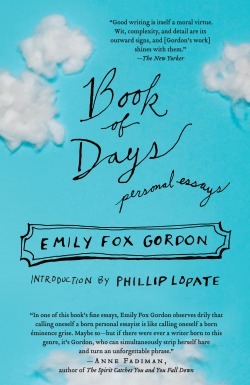 . .
Whatever the subject, Emily Fox Gordon’s disarmingly personal essays are an art form unto themselves—reflecting and revealing, like mirrors in a maze, the seemingly endless ways a woman can lose herself in the modern world. With piercing humor and merciless precision, Gordon zigzags her way through “the unevolved paradise” of academia, with its dying breeds of bohemians, adulterers, and flirts, then stumbles through the perils and pleasures of psychotherapy, hoping to find a narrative for her life. Along the way, she encounters textbook feminists, partying philosophers, perfectionist moms, and an unlikely kinship with Kafka—in a brilliant collection of essays that challenge our sacred institutions, defy our expectations, and define our lives.